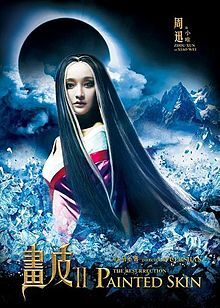 An ancient fox spirit embarks on a diabolical quest to become human after escaping an icy prison, and becomes bound to a disfigured princess who seeks the love of a noble guard as her kingdom crumbles in this lavish supernatural epic. Confined to a frozen cell for centuries, malevolent fox spirit Xiaowei regains her freedom and seeks to preserve her beauty by seducing men and consuming their hearts. Should a man offer her his heart willingly, Xiaowei will become mortal, breaking free of the underworld and experiencing living among the living. Meanwhile, as a dark cloud falls over her kingdom, Princess Jing flees, hiding her deep facial scars under a mask of pure gold while seeking the love of her former protector, who remains haunted by his failure to save her years prior. When destiny brings Xiaowei and Princess Jing together, the battle for the princess' heart begins. Believe it or not, me watching such movie *shakes head* LOL!!! There weren't many choices so just entertain lah since hubby brought this home to watch. It's a dark love story, quite unique but kinda fake too... CGI was overly done that some scenes were too fake. I guess that's the effect they wanted since this is just a fantasy movie. An interesting movie to watch during spare time especially since it wasn't as scary as the poster.